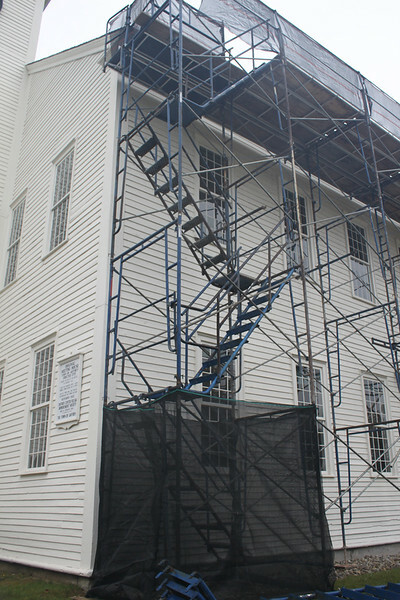 These photos show daily progress on the replacement of the Jaffrey Meetinghouse roof. This project is being supported by a Land & Community Heritage Investment Program (LCHIP) grant, a Conservation License Plate ("Mooseplate") grant, the Town of Jaffrey, the Jaffrey Historical Society, the Jaffrey Historic District Commission, the Jaffrey Center Village Improvement Society, the Amos Fortune Forum, the Bean Family Foundation, Terra Nova Trust, and an anonymous donor. Wednesday, September 20, 2017. 9am.